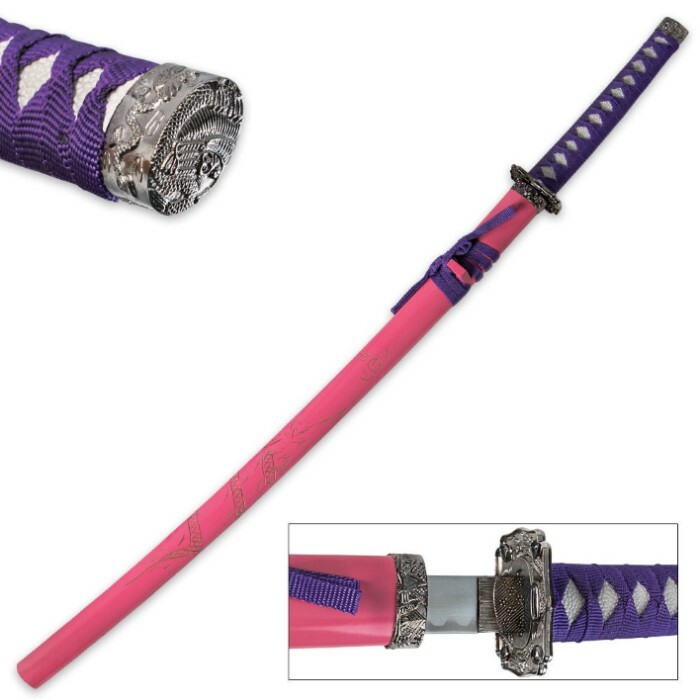 Whether you are looking for your first katana, or are already a master sword collector, this highly detailed yet low priced katana is an ideal pick to start or complete your collection. Each samurai sword is equipped with a flying dragon engraved wooden scabbard and 27 1/2 in. carbon steel blade with silver/satin finish. The guard and fittings are cast from steel, and the hardwood handle is wrapped with nylon cord. 39 in. overall. I got this for my first sword to my collection and so far I love it! My husband has bought from here before so I know I am getting good quality at a good price! Was a perfect sword for introducing my fiancee to my love of swords. An excellent sword. I got this for my sister and she loves it! Even more impressive though was the amazing quality of customer service I received when I mentioned a slight defect, the issue was resolved within the day the sword arrived in the mail. 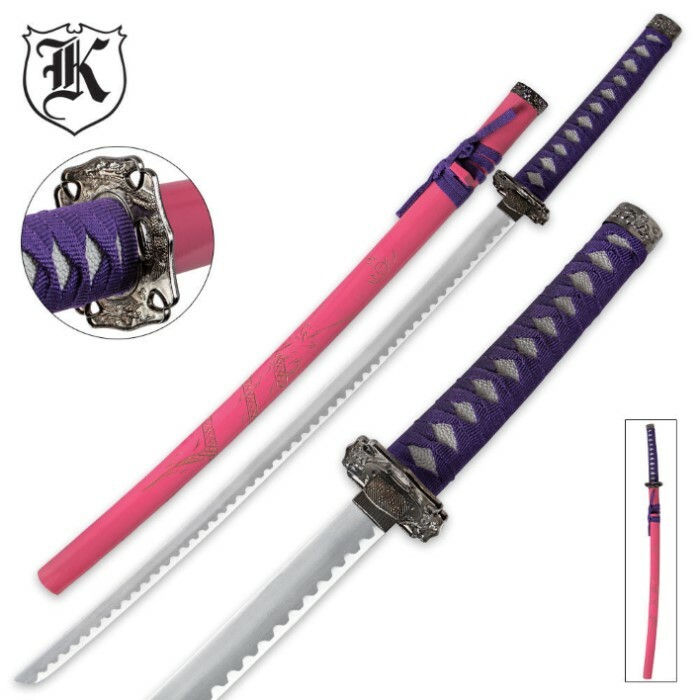 I definitely recommend this sword and this site for the purchase thereof, its hard to find service this good these days! This was my first katana from this site and it was decent for the price. The cord will become loose and undone when held for a fair amount of time. The blade is made of aluminum so it bends quite easily but can be straightend with a minimum amount of force. It can be easily be taken apart which is good for tightening the blade and i do not recommend touching the blade because it does scratch, ding, and chip very easily. A great looking sword however the blade wobbels a little bit but overall a great buy for the price. Bought this for my fiancee (shes asian lol) and she freaking loves it. The blade is not black or even nearly as close to the color as the picture, it was a stanard silver colored blade, still a nice solid display sword, great for the ladies. I give it 4 out of 5 ONLY because of the blade color not matching the picture. Other than that, the sword was in great shape, nice carving of the dragon on the sheath, and ofcourse one of a kind when it comes to the unique color scheme. I thought this would be somewhat shorter than the battle ready high carbon katana i bought, but they are virtually the same size. Great gift idea for the lady warrior, especially for only 20 bucks! I purchased this for my daughter and she LOVES it. I have no complaints. My girl was more than pleased with her new sword. No complaints to be made.